The home of container loading ramps from Thorworld Industries Ltd. Shipping containers and vehicle trailers require fast, efficient loading and unloading, but it isn’t always possible or practical to install a permanent docking bay. That’s why the container ramp – sometimes known as a mobile yardramp or loading ramp – is the ideal alternative. A container ramp is a portable solution that can be quickly and safely positioned at the back of a container truck to provide ramped access for forklifts. 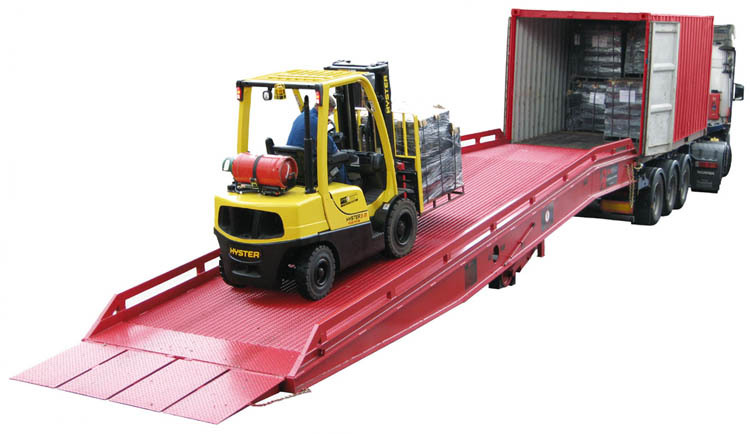 Using a container ramp can enable loading or unloading to be completed by a single forklift operator. Even businesses who handle only one or two loads per month typically find that this method is extremely effective and brings a swift return on investment. Thorworld Industries is a UK leader in mobile container ramps, with a range of models available to purchase or rent via our RentARamp division. Contact us on 01246-260602 – or fill in the form on the Contact page – to discuss your needs.